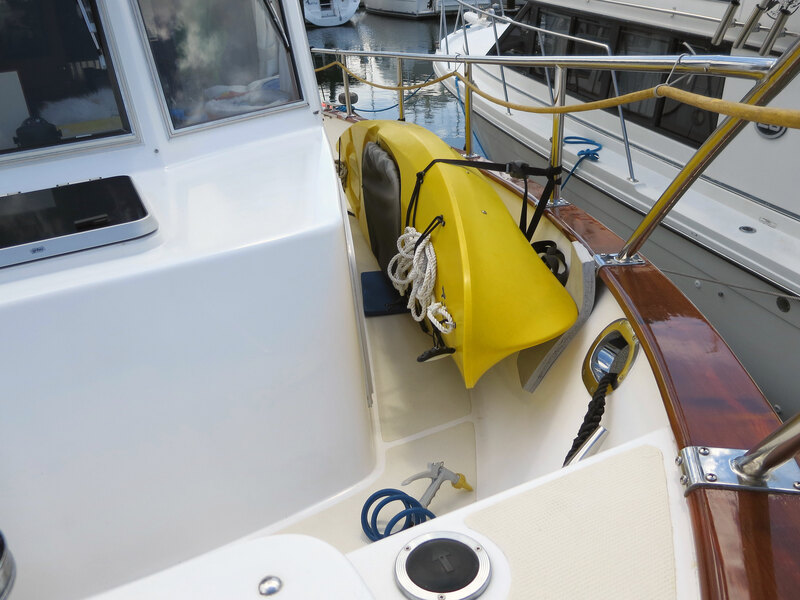 We stow our kayak on the port foredeck when we take it along. We got started early yesterday, with the intent of heading out on our cruise. It was cloudy and raining slightly, but the wind conditions looked good, and we got things ready to go. After breakfast, we went up to our storeroom and got the kayak to take along. The tide was on its way up, but the ramp wasn’t too steep yet, and we got the kayak down to the boat without incident, and stowed it on deck. Then, before we got underway, I decided to call our answering machine at home to pick up any messages. What a surprise! 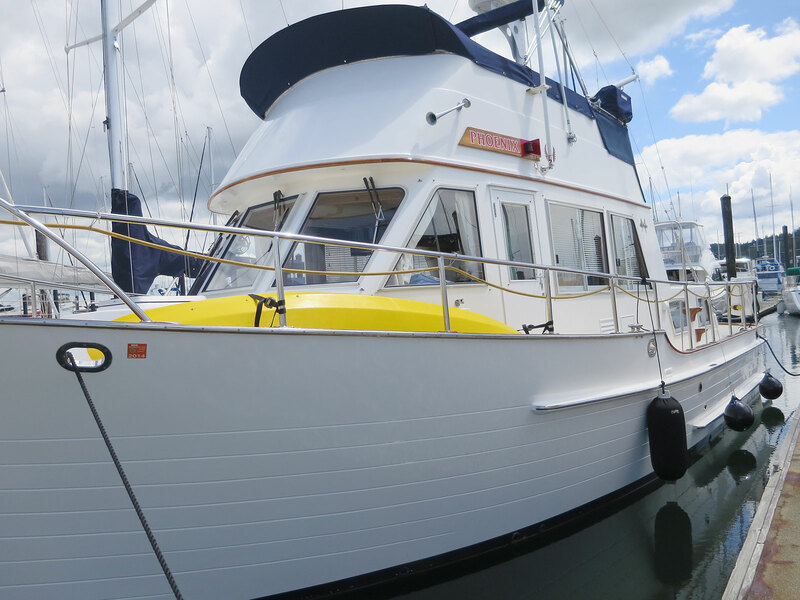 The kayak sits on the port foredeck, with most of it protected by the bulwark. We tie it down and it rides pretty well there. There was a message on the machine from our bank advising us that our credit cards were being replaced! They said that a merchant had compromised the security information on thousands of credit cards (including ours), and so the bank was mailing us new cards with a different account number. That’s certainly a good thing to do to protect our cards from fraud, but, of course, we aren’t home to receive the new cards! Their message advised us that our current cards would be deactivated on June 27th and we would have to start using the new cards. So I called the bank. In the back of our minds, we thought the message might possibly be a hoax, because of the way it was presented. However, the customer service people confirmed the situation. They were able to give us the new card number over the phone, but said that they were not able to give us the important 3-digit numbers on the back of the card. Rather, that we have to wait until we physically get the new cards and can get the number off the cards. So, we pondered what to do. We decided it was important to get the cards before we leave the U.S., so that we’ll have working credit cards to use throughout the cruise. After a lengthy conversation, they agreed to send replacement credit cards to our Anacortes address for a $15 fee. They said the cards would be sent via FedEx for delivery on Friday. We have rescheduled our departure for Saturday, giving us enough time to get the cards (hopefully) and regroup. But, that’s cruising. We make plans, but know we have to adjust our plans as situations come up. This could be weather, equipment failures, family issues, our health, or outside forces…in this case, it’s the outside force of our bank. Oh well, we always have things to do on the boat, and, other than being disappointed about leaving later than we hoped, another couple of days won’t make that much difference. 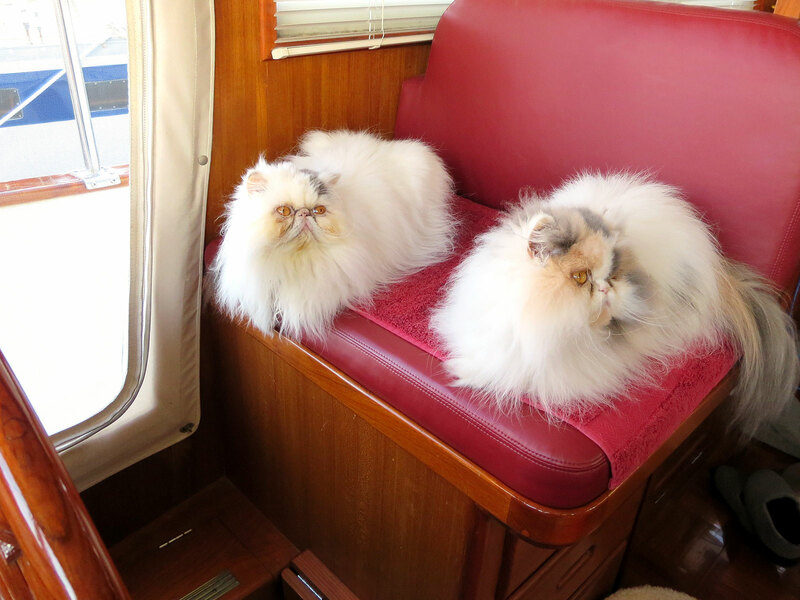 Mickey, on the left, and Rosie, on the right, enjoyed sitting on the helm seat and looking out the open cabin door while I cooked dinner. After the morning’s brief showers and clouds, the weather turned sunny, but cool for the rest of the day. Jim put the 2014 registration decals on our hull and worked on setting up his ham radio and APRS tracker. I used the time to work on organizing lockers and catch up on some computer projects, including working on this blog. When we provisioned this week, I bought ingredients for my recipe for Chicken With Black Beans and Rice, intending to make it when we were underway. It’s a good cruising recipe, because it makes about 10 servings and reheats great. I decided to make it tonight, instead of waiting until we were out cruising. First time I’ve made it on the boat this year, and it tasted great…perfect for this evening. I served slices of avocado and sourdough bread with it. We like to add a little heat to it, and pass Cholula Original Hot Sauce when serving. 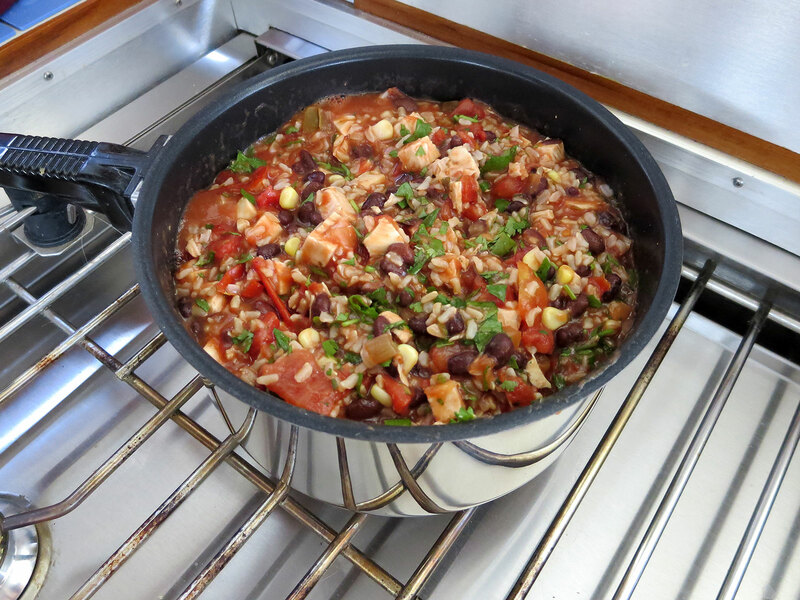 Chicken With Black Beans and Rice cooks in a large saucepan. It is colorful, tasty, and nutritious! This photo shows it in the pan, just as it is finished cooking and ready to serve. Now, I have lots of leftovers, which will give me some easy meals to prepare once we get underway. 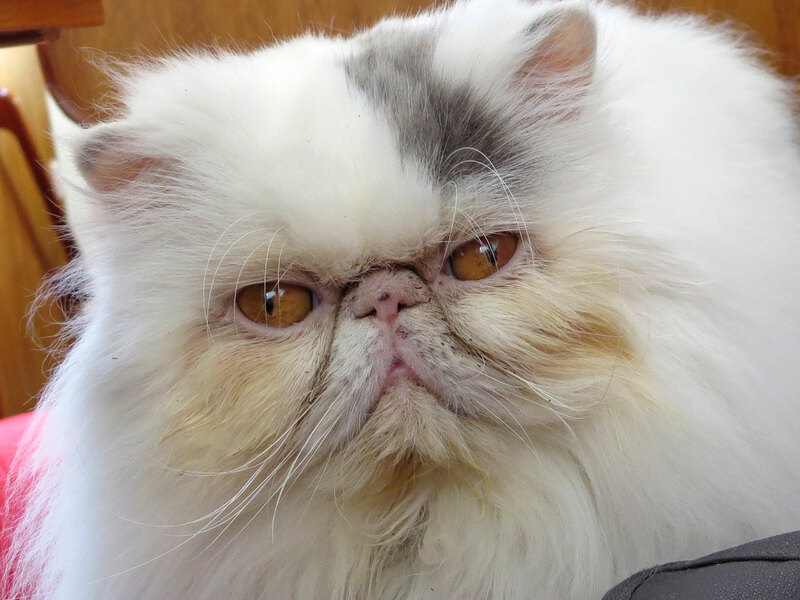 This entry was posted in Cruising, Food, Kitties, Life Aboard and tagged APRS, chicken with black beans and rice, cholula hot sauce, flexible cruising, ham radio, kayak, kitties, recipes by Sailor Lady. Bookmark the permalink. Good to hear from you! Nice to know you and Ron are following our blog. Hope all is good and that you are enjoying your new place. Yes, they do look alike! They have different behaviors so it’s easy to tell them apart when they’re moving, but if they are sitting still, we have to look closely to be sure we know which cat it is! They are not litter mates, but did come from the same breeder, and are sort of related…if I remember correctly, Mickey’s mother was Rosie’s grandmother. Or something like that. They were born one week apart in 2009, Mickey on July 5 and Rosie on July 11.